When looking for a good quality children's farm play mat it's vital you know what you're looking for, and with that in mind our top ten list features only the best. 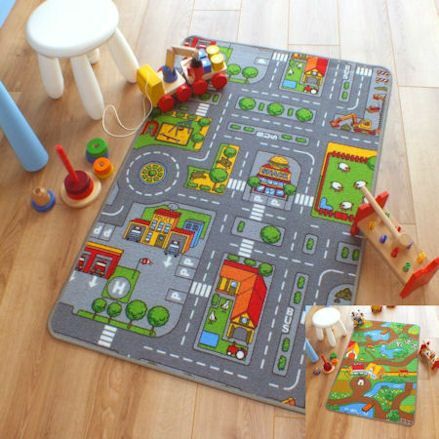 It's not been easy, a lot of thought should go in to buying a farm playmat, amongst the most important is material, is it washable, size restriction and the added bonus of a reversible mat with a farm scene on one side, and city roads on the other. So with that in mind, we've had to look a little harder to compile our top ten, as good quality mats are vital - but then they must have lots roads for the toy cars, features and colour as it's for the kids after all. So here is our top ten farm play mats and rugs, starting with our favourite, down to the least favourable, but still good enough for our list. 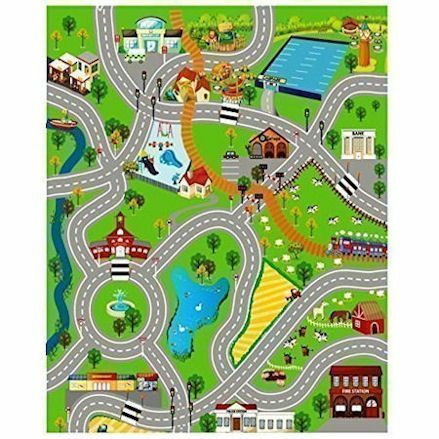 Marvelous double sided - or reversible - play mat with a city road on one side made up of lots of roads, roundabouts, crossings, buildings, shop, school, hospital and playground. Well on the over side of the mat is your farm scene, made up fields and a farmyard where you can driver your tractors and keep animals. Made from 100% Polyamide, it has an anti-skid backing, keep it clean using the household vacuum and measures 80 x 120cm. 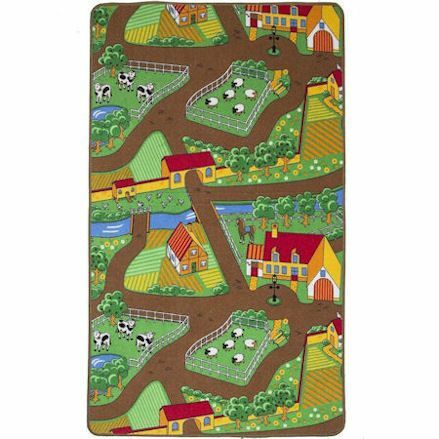 Bright and cheerful children's farm life play mat, featuring a cow and sheep field with fencing surround, trees and foliage, passing river through the rug and cultivated effect fields with a farm central to play. Drive your miniature farm vehicles around on the dirty effect country roads and share the animal fields with your toy farm animals. Colourful rug made with 100% Polyamide, with a depth of 5mm - or 0.5cm - with three sizes available, starting with this one measuring at: 100cm x 165cm (3ft 3″ x 5ft 5″). 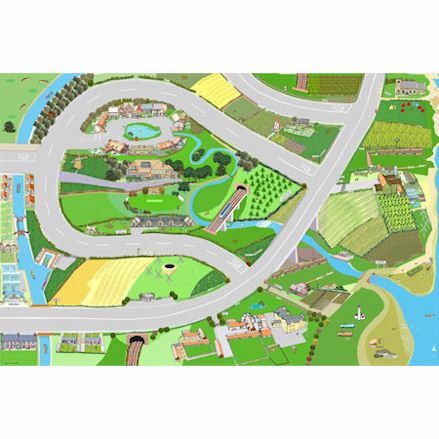 Colourful reversible farm and city road mat consisting of a busy city scene, featuring lots of straight roads with junctions, buildings, parts, car parks, roundabout, building site and leisure areas. 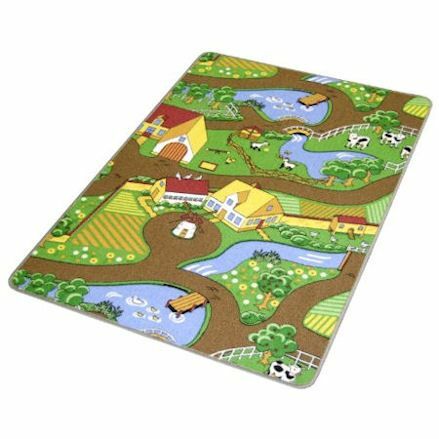 Then flip the mat over for an instant fun farm setting with buildings, made up with lots of winding roads of course, with fields - both cow field and cultivated fields - lakes, river and bridge. Soft to play on, made from thick material and measures approximately: 79 x 119cm. 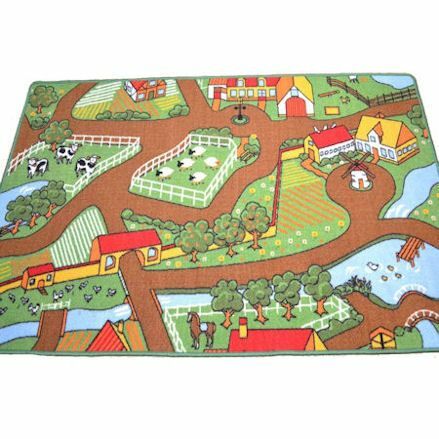 Actually, you might think this large farmyard play mat is the same to the ones mentioned above, and well they are not identical, they do pretty much have the same features, but in a different layout. Here we have a farm scene with brown country roads, farmyard, cow fields, farm fields and a blue river that leads to a lake with ducks. Soft to touch with a loop pile stitching, easy to clean with a damp cloth, strong grip backing with two size options including: 80cm x 120cm and 100cm x 133cm. 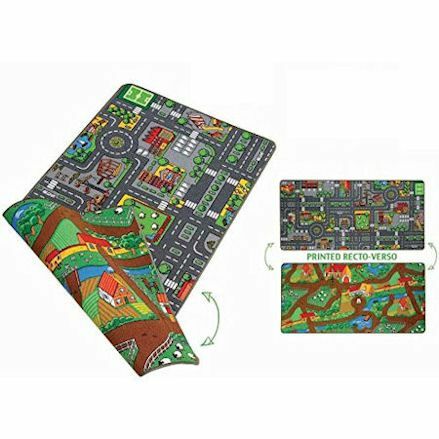 Unique reversible farm road mat with one side depicting a busy street scene with straight and curved roads with junctions, buildings, parking and a children's park. Well flip the mat over for a friendly farm scene, complete with lots of green fields with black and white cows, lake, bridge, farmyard with windmill and scenery. Highly detailed mat measuring 100cm x 165cm (3'3 x 5'4 approximate) and made in 100% nylon with looped pile design. What better than a farm theme play mat in the shape of an actual tractor. 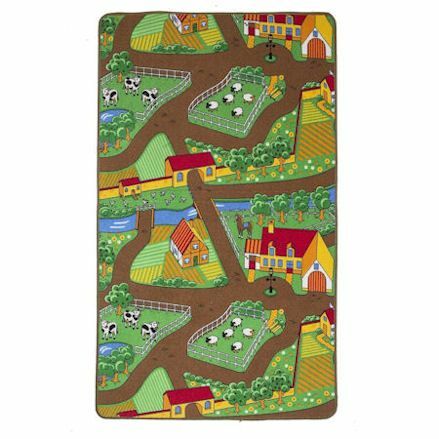 This large brightly coloured mat is jam packed with farm scenery. Drive around the main roads before heading off to the country roads to visit the farmyard through big green fields. Features, farm, tractor, chicken coop, trees, lake and garage. Proudly made in England and complies with all relevant safety standards. 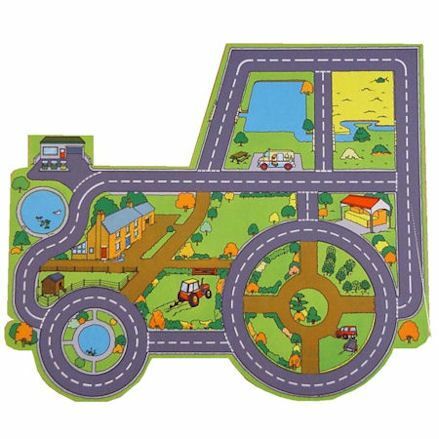 Explore the countryside in style, with this busy scenic play mat with big wide roads to drive down and smaller country roads to head down. Packed with realistic detail including fast train with tracks, river and lake, cultivated fields and up to three detailed farmyards. Printed on heavy weight vinyl and can be easily rolled for storage and wiped clean. 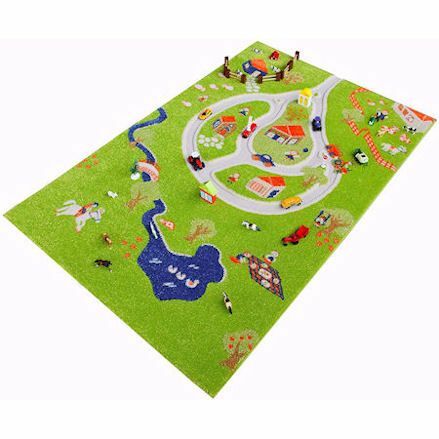 Ideal for a child's bedroom or a large playgroup, this farm and village play mat will be central to any farm play - all you need to do is add animals and vehicles. Realistic farm scene with lots of country roads that takes you passed buildings, fields - with cows and a horse - over a river and down the meadow. Made from quality polypropylene in Belgium, with a non-slip backing and comes in a huge variety of sizes. Suited to mid-west of America, you can drive your toy cars around the two lane roads well passing by a farm setting in the bottom-right corner. It also features various buildings, child's' park and a train track that passing through the mat with a river on the left side and a car park - or parking lot - on the top right. Made from roam so can't be used like a rug, has a thickness of 3mm, is water resistant and measures from 120cm x 100cm. 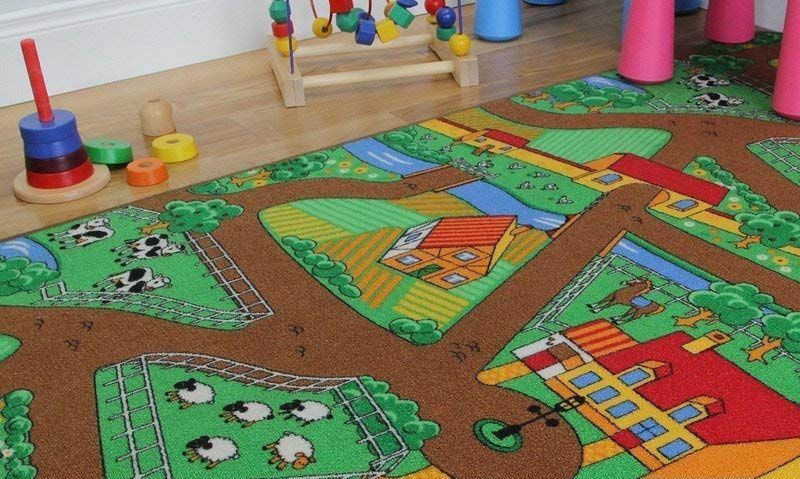 Well a farm play rug with a different prospective, this one makes it at the bottom of our list only because of the price, otherwise it's a good quality one. This 3D farm setting mat displays a field with a grass like texture, and as if the road is sunk into the mat - but this is due to the 3D feature. Ideally suited to big farm animals and vehicles, it's hypo-allergenic, anti-static, non-flammable and stain resistant.